I met Veronika Hilská last October during the Bienvenue Arts and Crafts Fair. Veronika, who studied jewelry design at the Academy of Applied Arts in Prague, was selling handcrafted accessories with a group of Czech and French artists in Prague’s picturesque, baroque Malá Strana district. Veronika’s unique pieces are characterized by organic shapes and rich color. Her enamel jewelry uses painterly techniques that make earrings and pendants into wearable works of art. 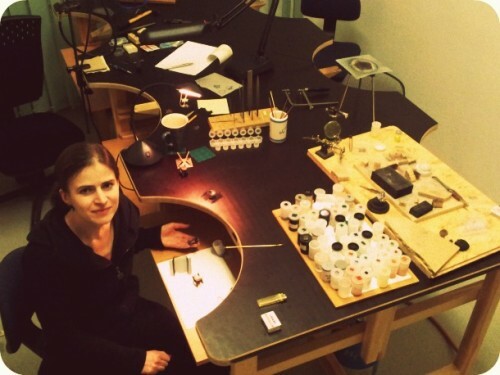 When Veronika told me that she teaches jewelry-making classes in her studio, I jumped at the opportunity to study under such a skilled artist. I’ve been taking classes with Veronika since the fall, making the trek to her workshop in the evenings after work. The process of learning basic metalsmithing, wirewrapping, and enameling techniques has given me an even greater appreciation for the complexity of Veronika’s craft. Veronika was kind enough to answer my questions about her craft and her inspirations for Herb and Lace. When did you get your start making jewelry? I studied at an arts school, where we tried many media: drawing, painting, nearly all of the classical techniques of printing, modeling in clay, working with paper, and graphic design. I very much enjoyed painting, but unless I left them unfinished, there always came a point when I realized that I’d just spoiled my paintings. With jewelry and objects this problem doesn’t occur. The studio I applied to was offering not only work on jewelry, but also all sorts of three-dimensional objects, which attracted me at the time. I really started working properly on jewelry-making after graduating. Why do you like working with enamels? When I was accepted to the Metal and Jewelry studio at the Academy of Applied Arts, most of the works I brought to show were paintings. They told me that I could use painting in an enameling technique, and that sounded great to me. I enhanced my experience by learning other techniques during an exchange stay in Finland. I could really develop my enameling work only after I bought my own enameling kiln, when I was out of school. First I liked to “play” with the enamel; I found some new techniques by experiment. Someone saw it and asked me to make a collection for a selling event accompanying a classical music festival. 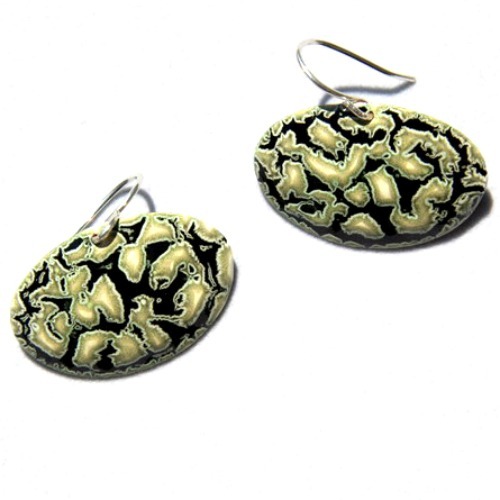 These were handmade, but simple shapes “decorated” with enamel. I like enamel most because of the wide variety of colors one can use. The process itself is very exciting, especially when I’m using some of my techniques, or trying something new. You put something into the kiln, and what comes out is totally different from what you imagined. Taking a piece out of the kiln can be almost magical. When you open the door of the glowing bright orange kiln, take out the piece, and leave it to cool down, the colors fade from bright orange to very dark. Only then do the true colors start bleeding through. How would you describe your jewelry-making style? I am still developing my style. I have a lot of work done, but even more is in front of me. When I started teaching jewelry classes, I had to explore a wide variety of techniques. Each one of the techniques is interesting and inspirational in its own way, but they kind of disintegrated my style. Nevertheless, I believe that within some horizon of time, my work will be more legible. It will be more clear how the things relate to each other, and what the source of inspiration was. I prefer more ornamental and organic to minimalistic, cold design styles, but it must be original. If I had to use one word I would probably say nature. Nature is the magician humans can’t compete with. It is endlessly inspirational. But I also like to be inspired by architecture, and ethnic or ancient jewelry. But, as I described earlier, many times the look of a piece is defined by an accident. Which artists or designers do you admire, and why? Of course I have many favorites, but in this particular field, it’s difficult to keep up. I remember once at school, I came across some works by Christianne Föerster and I could say that influenced me back then, because I didn’t know that jewelry could look like this. Her jewelry looked quite fragile and very intriguing–like mysterious talismans of personal mythology. Then I recently found some new works by Giovanni Corvaja, who’s using thin golden wires to make jewelry that resembles fur. Weaving golden wire is associated with fairy tales, which often deal with the ambiguity of values. I also recently discovered Ute Kolar, Jacqueline Ryan and objects by Junko Mori. What are a couple of your favorite spots in Prague? I like higher places, spots alongside the river, and the islands. I also like watertowers and gardens. I like the iron bridge, and the riverbank nearby is my favorite. What is your favorite place to take visitors in the city? It depends on the kind of visitor. Probably St. Vitus cathedral and St. Nicholas. I like the Royal Gardens a lot and the singing fountain. But I also like places that are off the usual touristic routes, but just by them. They are astonishingly quiet, as if they were forgotten by the rest of the world. You feel like you are in a village. I like this a lot about Prague, but I’m afraid it won’t take long until every inch of the central town will be used up. Lots of these places already have been changed, or are no longer accessible. Prague Galleries: Faktor Traktor, Artum, AG Flora. This entry was posted in Chat, Prague and tagged accessories, art, camilla, covet, create, design, enamel, jewelry, kahil, prague, talk, veronika hilska.